The Granite is Celestron’s newest line of high-quality binoculars. Granite EDs are roof prism binoculars with a modern, open bridge design, available in 8x42, 10x42, 10x50 and 12x50 configurations. Like most roof prism binoculars these days, they are fully sealed and nitrogen-purged to be waterproof, dust proof and internally fog proof. As the ED label implies, Granite binoculars are made with high-density, Extra-low Dispersion glass, which provides major performance enhancements relative to regular garden-variety glass (see below). Typically, you pay a lot for ED glass, but Celestron Granite binoculars are a delightful exception to this. The 8x42 model sells for $349.95, while the 10x42 models costs $359.95. The 50-mm Granites are somewhat more expensive at $449.95 for the 10x version and $459.95 for the 12x50. Right as we were ready to publish this article, Celestron added two more Granite models to the line, a 7x33 and a 9x33 which sell for $319.95 and $329.95 respectively. We thought those could be pretty interesting too! The arrival of a 7x33 in-house confirmed that, and we delayed the article to evaluate it too. In our field testing, we were very pleased with the optical performance of the Celestron Granite binoculars. The image was bright and very sharp, and they had a large sweet spot in the center, although the field edge is a little soft. Field curvature was relatively minimal and we noted only slight chromatic aberration on brightly-lit, high-contrast objects. In particular, the 7x33 Granites had very little chromatic aberration. This kind of performance comes from two general sources: good glass and good coatings. 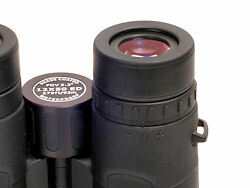 As noted above, Granite binoculars feature ED glass, and BaK4 prisms with high-reflectivity coatings which improves both image clarity and light throughput. Additionally, the Granites are fully multi-coated for better image contrast and greater light transmission. Lastly, Granite ED binoculars are phase-coated for the maximum image sharpness. What you see are bright, natural colors relatively free of distortion or color aberration. Other optical properties of the Granite binoculars are summarized in the table below. Close focus is the minimum distance that the binocular can be brought into sharp focus on an object. Field of view is expressed as the linear distance of field in focus at a focal distance of 1000 yards. Eye relief is the distance the image is cast from the surface of the ocular lens. Turns is defined as the number of full turns of the focus knob to go from minimum close focus to infinity. What we see in this comparison is that the five models across three different size classes, (33, 42 and. 50 mm objective lenses) vary significantly in certain properties. The 7x33 model close focuses to just 5.5 feet, which is excellent. The 8x42 model has a very good close focus of just 5.75 feet, well below average for 42-mm binoculars. At 6.7 feet, the 10x 42 is good, but not as stellar as the other two. It should be noted that our close focus distances are shorter than those published by Celestron, so at least in our hands, they do better than advertised. 50-mm binoculars typically don’t do as well in this characteristic, and the Granites follow that pattern. The 10x50 model has a close focus of 8.9 feet (Celestron listed them as 9.8 feet) while the 12x50 has a “close” focus of 15 feet. While that is not great for watching warblers in a forest, it may do very well for hawk watching or checking out distant game across a valley. Field of view is typically inversely proportional to magnification, and in this, the Granites hold true to form. The 7x33 model has a truly panoramic 477-foot field of view. The 8x42 model has an excellent field of view at 426 feet, while the 10x42 is better than average at 340 feet. The 10x50 model had a 342-foot field of view, which is really excellent for a 10x50. The 12x50 was somewhat more modest at 279 feet, but when we started checking published fields of view for other 12x50 models from other manufacturers, we found that this was pretty average overall, with only significantly more expensive 12x50 binoculars having a larger field of view. Eye relief on the Granites was average for the size classes, the caveat being that 15 mm is just a tad short, so some eyeglass wearers may find the 7x33, 10x42 or 12x50 models uncomfortable to use. The turns of the focus knob is not exactly an optical property, but it helps suggest the engineering balance of how quickly the binocular responds versus how easy it is to achieve fine focus. We prefer a fairly fast response on this – something on the order of 1.3 – 1.7 turns, so the 50-mm Granites do quite well here. The 7x33 is really zippy at just 1.2 turns. Both 42-mm models are a bit slower responding, but they achieve sharp focus very easily as a result. The physical characteristics of the five Granite binoculars are summarized in the table below. So what do the numbers tell us? 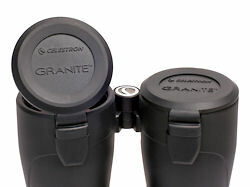 For starters, the 42-mm Granites are pretty compact in terms of their size and weight, being generally smaller and lighter than other comparable roof prism binoculars. Interestingly, the 7x33 model is exactly the same size as the two 42-mm models, but having smaller diameter barrels and less glass, it is quite a bit lighter. We feel anything under 27 ounces is fairly good for weight. The 53-mm minimum end of the interpupillary distance is unusually small, meaning that these binoculars may be more comfortable for users with smaller or narrow faces, while the 74-mm end is right on average. The size seems pretty much in line with the design, and it’s worth noting that the weight is a natural consequence of having that much extra glass in the binocular. In fact, we know of quite a few 42-mm binoculars whose overall weight is in the 30-ounce range, so if anything, the Granites are fairly light weight, given that consideration. The reduced interpupillary range is a direct function of the flaring of the barrels to accommodate the larger objective lenses. However, that does mean that these will not be suitable binoculars for people with smaller faces. 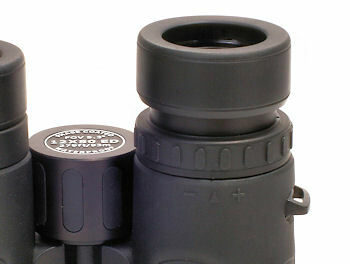 All Granite binoculars are covered in smooth matte black rubber armoring that is free of any texturing. Shallow thumb grooves on the underside of the barrels increase the comfort of the grip overall. The barrels flare ever so slightly in the 33- and 42-mm models, while that effect is considerably more pronounced in the 50-mm versions. The open bridge design allows at least two fingers to curl into the space between the bridges; on the longer 50-mm binoculars, there’s room for three. In both cases though, you can’t really do this with both hands simultaneously. This means you can have a fairly secure one-handed grip, but when using two hands, you tend to curl one over the top, which is fine. The eyecups adjust with the standard helical-twist mechanism, with one stable intermediate position between fully in and fully out. The action is smooth and fairly precise, so we give Celestron a good grade for these. We noted that the focus mechanism was a bit stiff out of the box, but that it got easier with use, and generally focusing was smooth and easy. We do wish the focus knobs had just a bit more texture on them for better traction. Besides focusing, Celestron Granite ED binoculars have the same two basic user adjustable features: eyecups and diopter. The eyecups adjust with the standard helical-twist mechanism, with one stable intermediate position between fully in and fully out. The action is smooth and fairly precise, and the eyecups don’t tend to collapse during use in the field, so we give Celestron a good grade for these. The diopter adjustment is a simple twisting ring beneath the right ocular lens. A raised vertical dash on the twist ring lines up with a triangular mark on the armoring of the barrel to denote the position for equal eyes, with minus and plus signs on either side to indicate the direction of adjustment. The mechanism does not lock, and there are no markings to indicate positioning away from the equal position, though you can sort of approximate other positions using the raised oval markings on the twist ring. This is a typical basic diopter adjustment mechanism, and it’s fine as far as it goes. 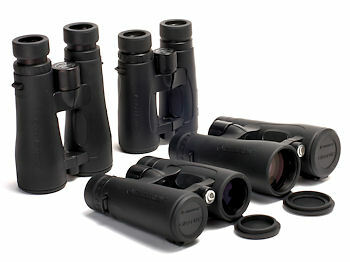 The rainguards for all four models of Granite binoculars are identical. This rainguard is two deep cups of pliable rubber connected by a flexible linking bridge. The rainguard fits firmly yet easily over the eyecups and does not dislodge accidentally. There is a gapped bracket on one side and a fixed bracket on the other, for fitting the strap through. Basically, it would be hard to improve on the simplicity or functionality of this rainguard. Unfortunately, we’ve less positive to say about the objective lens caps. The lens caps are tethered to a bracket beneath. We had multiple problems with these lens caps in the field when testing the binocular. We have made our findings available to Celestron, and hopefully, they will re-engineer a more elegant solution to this. In the meantime, we’ve done some investigating and have discovered several potential 3rd-party alternatives to the lens caps from Celestron. Customers interested in the Granite binoculars shouldn’t let this issue prevent them from purchasing. Rather, we suggest you talk with us about how to achieve a workable solution using a third party cap. By contrast, Celestron did a great job with the straps. In addition to a standard neck strap, which is fairly comfortable, Celestron also provides a harness strap of rather interesting design with the binocular. Since harness straps are usually an extra, and in the case of 50-mm binoculars, a rather necessary extra, you have to give them credit for this inclusion. The case is made of rubber-coated fabric, and provides padding to protect the optic. The lid closes with a pressure-opening clasp. There is also an outer pouch for lens cleaning tools or whatever. This is a good, simple, functional case. All in all, we like the Celestron Granites a lot, particularly the little 7x33s. They offer a great level of optical quality at a lower price. The Granites continue the trend of making high-quality glass available to those who don’t have $1000 to spend on a binocular. Celestron Granite binoculars provide an excellent value at their price point. And we really like having a good birding binocular from Celestron to talk about. If you are in the market for a low-cost birding glass, you really should consider a Granite binocular.